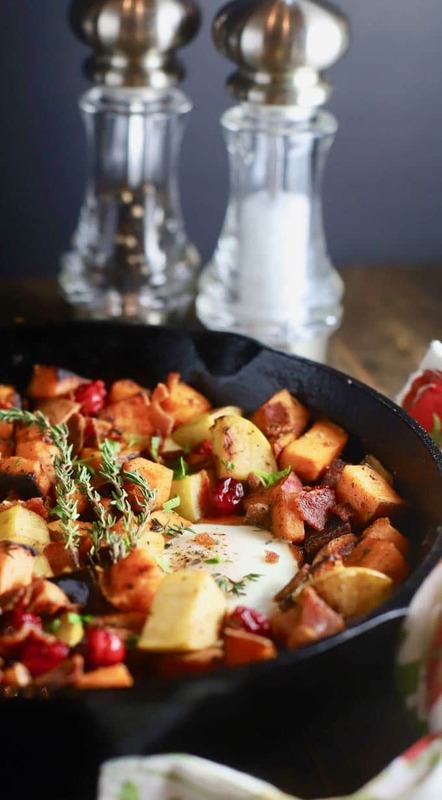 Easy Southern Sweet Potato Hash is full of healthy sweet potatoes, crisp Granny Smith apples, tart cranberries, and bacon cooked with eggs in a cast iron skillet! 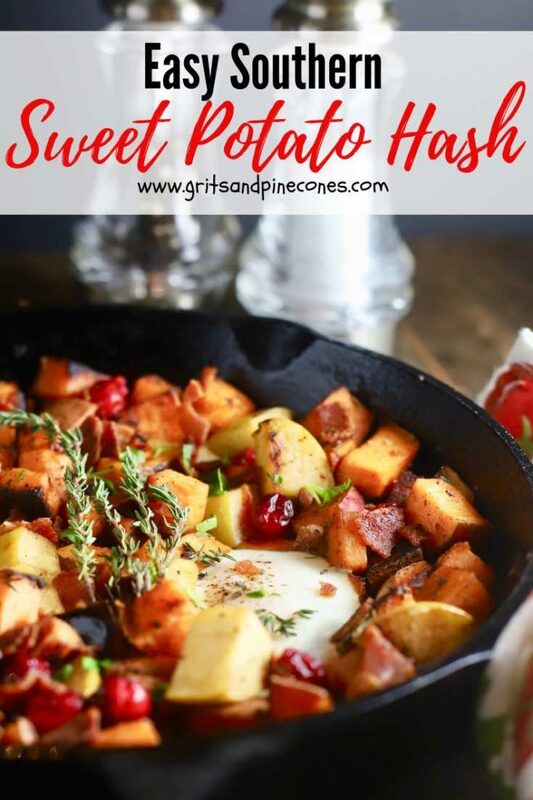 Versatile, sweet and savory Easy Southern Sweet Potato Hash is the “breakfast of champions” and a great way to start the day! 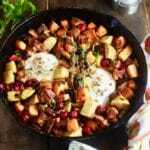 It also makes a tasty brunch main dish, and we even had it for dinner the other night. Leave out the eggs, and you have a flavorful side-dish. It’s no secret Southerners love sweet potatoes! And, we put them in all sorts of dishes including pies, soups, biscuits, and casseroles, every chance we get. My husband, in particular, is a big fan of sweet potatoes, and I am always on the lookout for new recipes. This recipe, my friends, is a winner and deserves a place in your list of “go to” meals! 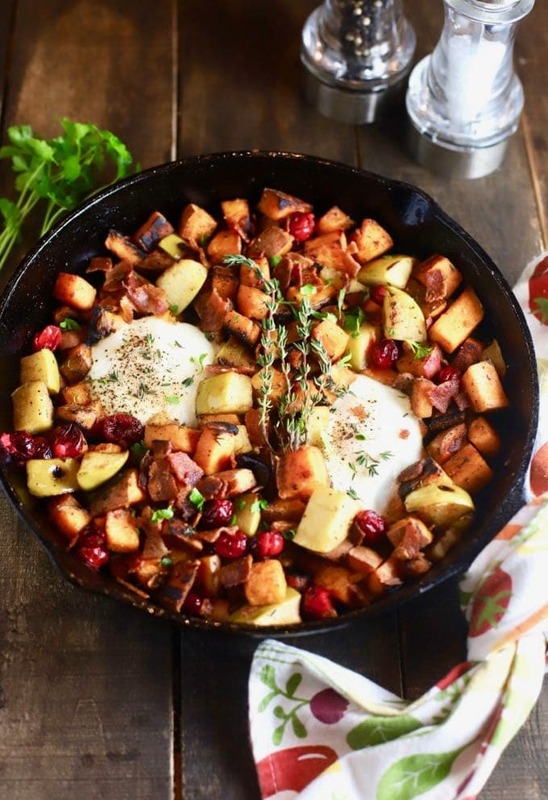 Of course, the apples, cranberries, and eggs in this flavorful dish are nutritional powerhouses too! The short answer is yes! Leaving the sweet potato skin on, adds even more, fiber and vitamins. Just be sure to scrub the potatoes thoroughly. And, cut off any hard places or skin that is discolored before you cube the potatoes. 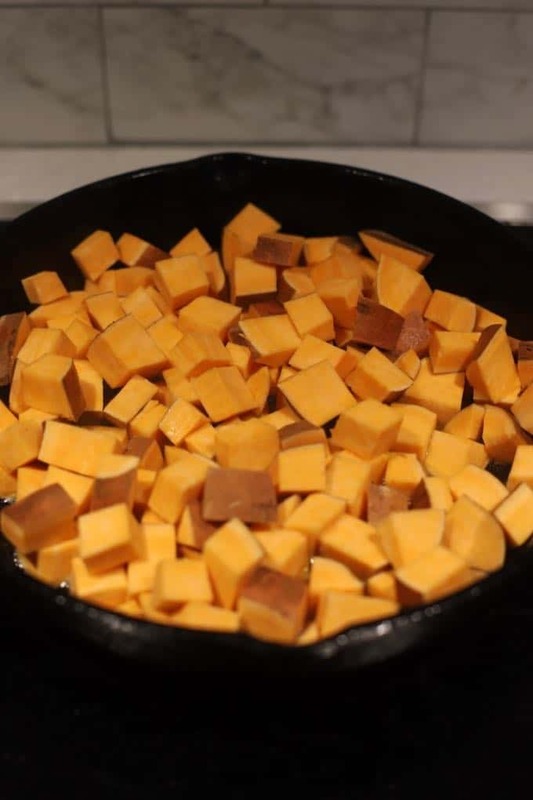 If you like sweet potatoes as we do, you might also like these popular recipes on my blog: Baked Southern Candied Sweet Potatoes, Easy Creamy Southern Sweet Potato Soup, and Easy Southern Sweet Potato Pie. Sprinkle the eggs with just a bit of salt and pepper to taste and place in the oven. Cook for 7-8 minutes for “over light” eggs with a runny yolk. The times as shown for baking eggs in the oven assumes you like your eggs “over easy” with a runny yolk! I like my yolks hard, so I leave mine in the oven for a few more minutes. In any event, oven temperatures vary widely so start checking your eggs at about six minutes to ensure they are cooked how you like them. This recipe works best with a “well-seasoned” cast iron skillet. However, any oven-proof skillet will work as well. You can certainly substitute another apple variety for the Granny Smith. But, I like the firmer texture and tartness to contrast with the sweetness of the sweet potatoes. You can substitute dried cranberries or Craisins for the fresh cranberries, or you can leave them out altogether. If you don’t have fresh thyme, you can substitute 1/2 teaspoon of dried thyme. 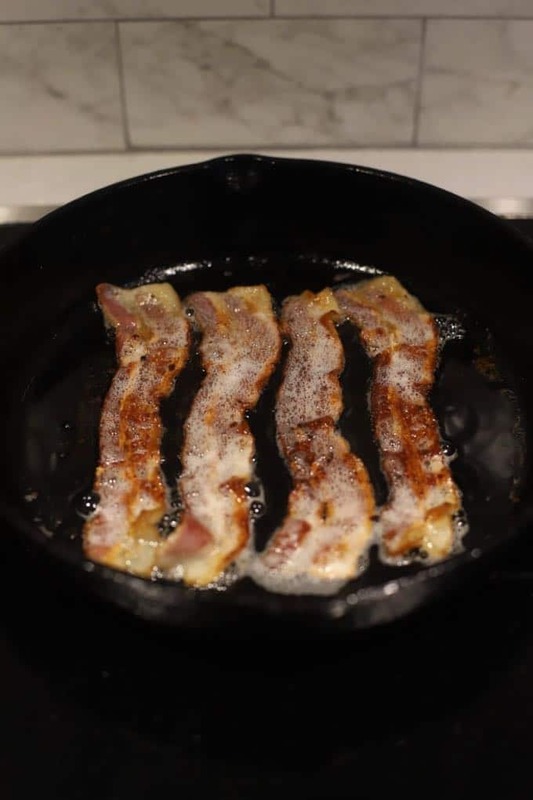 Carefully remove the pan from the oven, garnish with the bacon and a sprig of fresh thyme if desired and serve immediately. 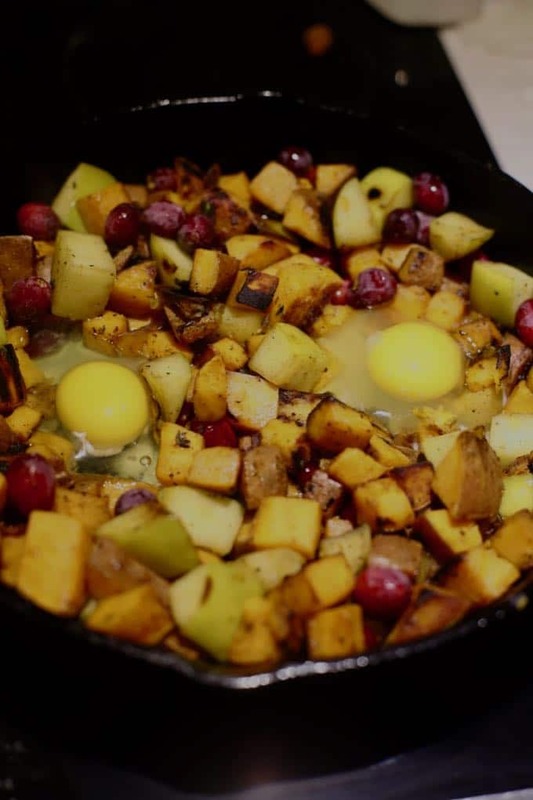 This recipe works best with a "well-seasoned" cast iron skillet. However, any oven-proof skillet will work as well. Sharon, this looks so fabulous! 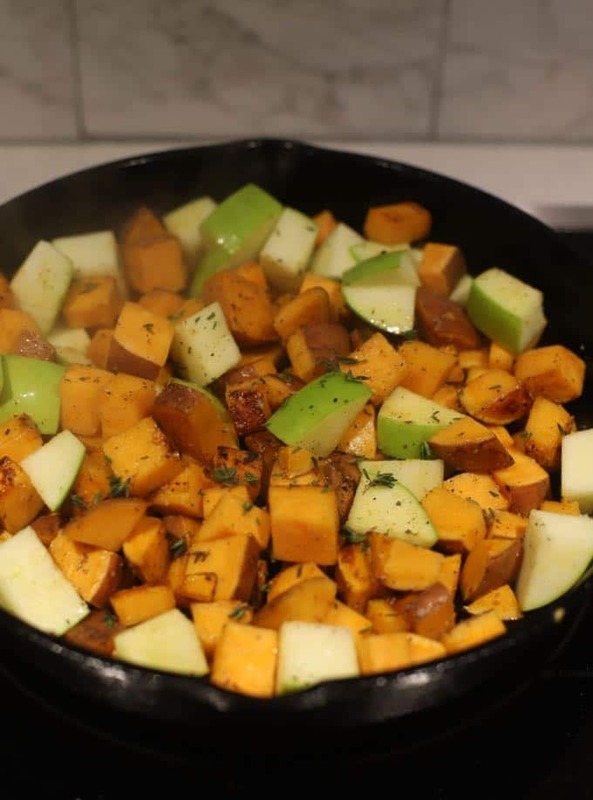 Love the idea of sweet potatoes and granny smith apples. This is not only the “breakfast of champions” it is a “meal of champions” for any time of the day. Thanks so much for posting. I made this recipe and brought to my book club brunch, without the eggs, as a side dish. It was a big hit and I’m going to share the recipe on our Facebook page. One comment is that you never said when to add the crumbled bacon. I added it with the cranberries.